This is such a simple thing to do, and there’s no better time to do it than in the summer when so many fruits are in season. Cut up any soft ripe fruit, and put them into silicon cupcake liners or wrap in plastic film. Then stash each cup or bundle in a freezer safe plastic container. You can then take out a cup or two and tuck them into your bento box. They act as an edible cooler for your bento. 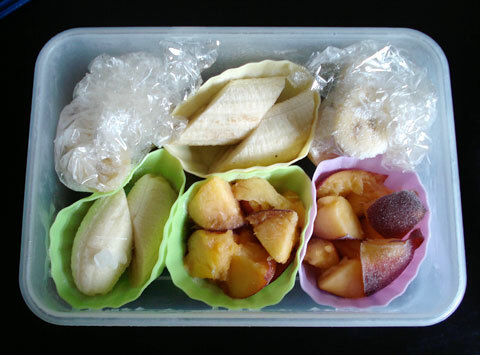 The container here has a cut up nectarine (divided into two silicon liners) and 2 small bananas (divided into 4). You may find that the plastic film wrapped bundles in particular ‘sweat’ some moisture. To prevent the food next to the bundle from getting soggy, put an extra layer of plastic (like a baran) or a piece of paper towel around the frozen fruit bundle. If you’re using silicon liners, you can just put the frozen fruit cup and silicon liner inside another liner. Do try to use up the fruit within about a month - the longer they are kept frozen, the more they will deteriorate in flavor and texture. I’m not much of a breakfast person, so I prefer something light. This has been my favorite breakfast lately. 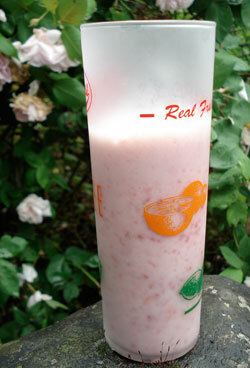 I just whiz up two to three of the frozen fruit bundles with 1 cup of soy milk (low-fat cow’s milk will do fine too) and a little water with a stick blender. It’s about 150 to 200 calories, and the combination of protein plus fat in the soy milk, plus the sugar in the fruit, keeps me going fairly well until lunch time. (Sometimes I’ll have a slice of bread or something too.) The one in the photo here has frozen strawberries and nectarines. Incidentally, a popular diet in Japan touts the benefits of combining soy milk with fruit or vegetable juice—it’s supposed to give you plenty of energy and suppress your appetite. It does do both indeed, though of course you have to watch the rest of your intake if you want to lose weight!